Responding to recent comments from a facility manager that fires in data centers are rare, Onward and Upward offers a recap of three such fires that have happened in the previous 11 months with details on each. 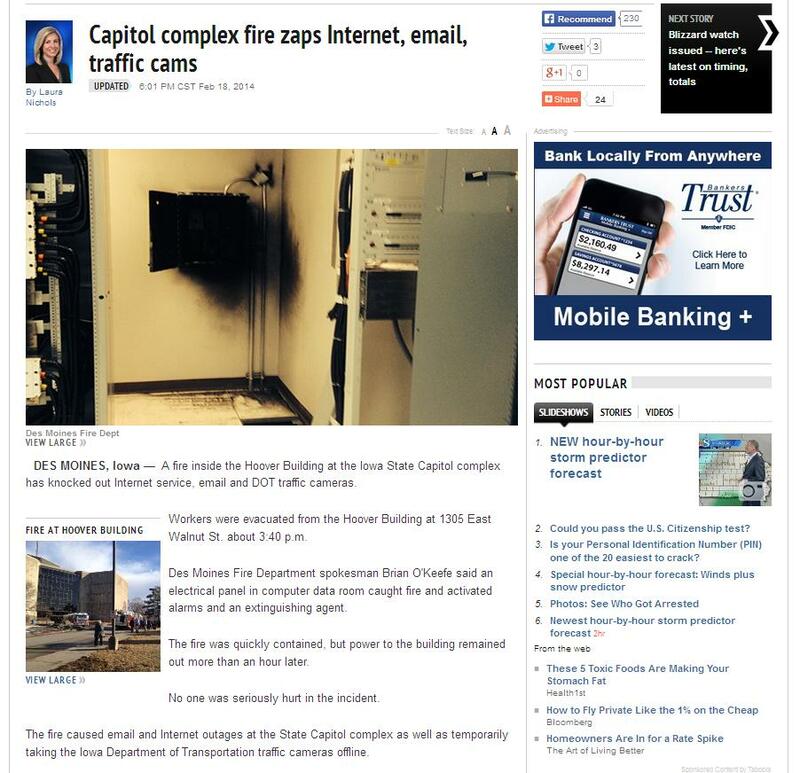 ♦ A fully-powered, but unused transient-voltage surge suppressor (TVSS) failed in the Hoover State Office Building’s basement l evel data center on the afternoon of February 18, 2014. The failure caused significant damage to the unit and produced smoke throughout the room. A quick-thinking employee activated a manual release station that discharged over 2,400 pounds of FM-200 clean fire-suppressing agent throughout the room and raised floor. In addition, the agent release also triggered the emergency-power-off circuit dropping power to critical equipment. The Des Moines, Iowa fire department responded within minutes of receiving the signal from the building’s automatic fire alarm system. Upon arrival, the fire was extinguished and personnel were assessing the fire damage and working to restore operations. 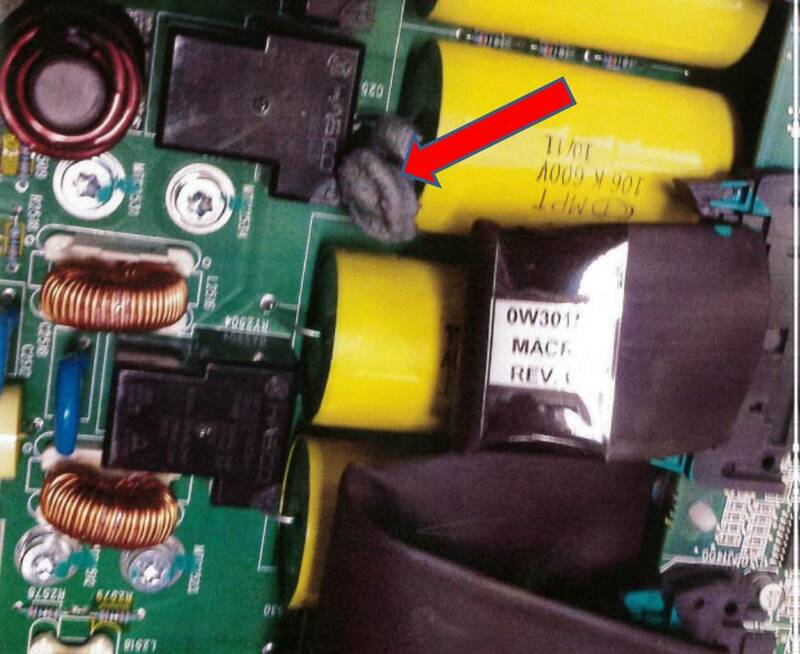 ♦ The catastrophic failure of a capacitor caused dense smoke to be generated within the cabinet of an uninterruptible power supply (UPS) unit at a central Iowa data center on March 19, 2014. The FM-200 clean agent fire suppression system incorporated a VESDA air-sampling smoke detection system that quickly sensed the smoke and automatically released 385 pounds of agent. The fire was extinguished by the time local fire teams arrived on the scene. While the facility itself was unaffected by smoke damage or the clean agent discharge, it took over a day and a half for personnel to locate the failed component deep within the UPS unit. ♦ The malfunction over-heating of evaporator coils on a self-contained computer room air-conditioner ignited collected dust and paper filaments in the raised floor of a Des Moines area data room. The slow smoldering of the materials was sensed by a smoke detector located under the raised floor on the evening of September 18, 2014. A second smoke detector confirmed the smoke condition and initiated the discharge sequence that notified the building’s automatic fire alarm system and released 274 pounds of FM-200. The small data room was unoccupied at the time of the event. When facility and fire department personnel arrived, the fire was extinguished and there was no damage caused by the agent’s discharge. While it maybe uncommon to have three events occur within a short time span, it’s clear that it’s not uncommon for fires to occur in data centers. Each of these incidents could have easily gotten out-of-hand and escalated into major disruptions for these facilities. However, because of forethought by prudent operators and well-designed and maintained clean agent fire suppression systems, the effects of each of these fires was minimized so that mission-critical functions could return to normal. Posted by shawnpci in Fire Protection, Fire Systems, FSSA. UTC Climate, Controls and Security announced yesterday, July 23, 2013, that it has sold its Industrial Explosion Protection business to IEP Technologies, LLC of Boston, MA. IEP Technolgoies, LLC is a new company formed from four leading explosion protection companies in the United States, United Kingdom, Germany and Switzerland. According to their press release, their mission is to offer leading edge explosion protection solutions to their customers worldwide by designing the best protection solutions, manufacturing innovative explosion protection components; providing precise applications engineering; and supporting their systems with responsive sales/service. The new company was formed in response to UTC’s transformation to divest non-core businesses. The explosion protection business is a niche business which requires customized application engineering; best suited to a single focused company. Leadership of the new company comes from the four acquired business units. Randy Davis, Chief Executive Officer and President, is a 26 year industry veteran and most recently was General Manager of Global Explosion Protection for United Technologies Fire and Security. Protex Central, Inc is an authorized service center for Fenwal IEP Technologies for the states of Iowa and Nebraska. To learn more about IEP Technologies, click here. Posted by shawnpci in Fire Systems. One of the special systems that Protex Central services and maintains is an explosion protection system designed and manufactured by Fenwal Safety Systems, a division of United Technologies. Operating primarily in the grain rich area of the middle west, we have several applications that are protected with such systems. I recently came across a site that collects and tracks various dust fires and explosions from around the world. All too often, many of these situations could have been minimized or even avoided with the use of properly designed and installed explosion protection systems.